In MACBETH, players, called “analysts,” are presented with a fictional scenario of an impending terrorist attack, and their task is to figure out who the suspect is, where the attack will occur, and what method of attack will be used. 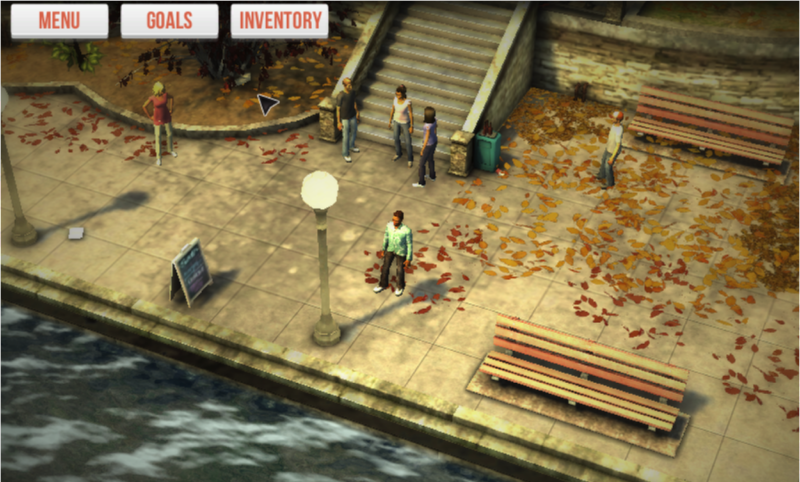 MACBETH is a turn-based game, where a human participant plays cooperatively with two non-playable characters (NPCs). 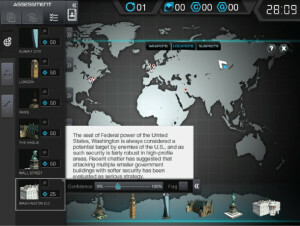 In any one turn, analysts are able to gather two pieces of information about the suspect, location, and/or weapon from a combination of intel sources. 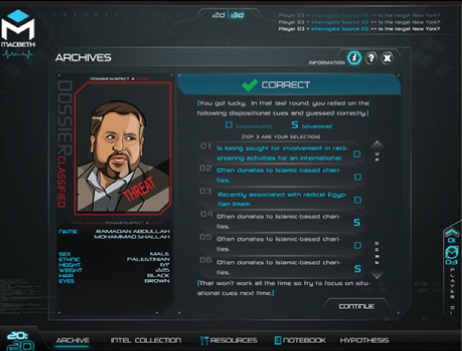 After gathering information, the human player can generate a hypothesis or aid another analyst (an NPC) if they have information proving or disproving the other analyst’s current hypothesis. 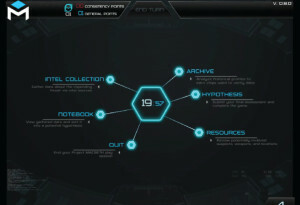 Throughout the game, analysts learn about the cognitive biases, and receive implicit and/or explicit feedback (based on condition) encouraging them to delay making a hypothesis, seek disconfirming information that can be used to disprove their hypothesis, and offer alternative hypotheses in their efforts to mitigate confirmation bias. 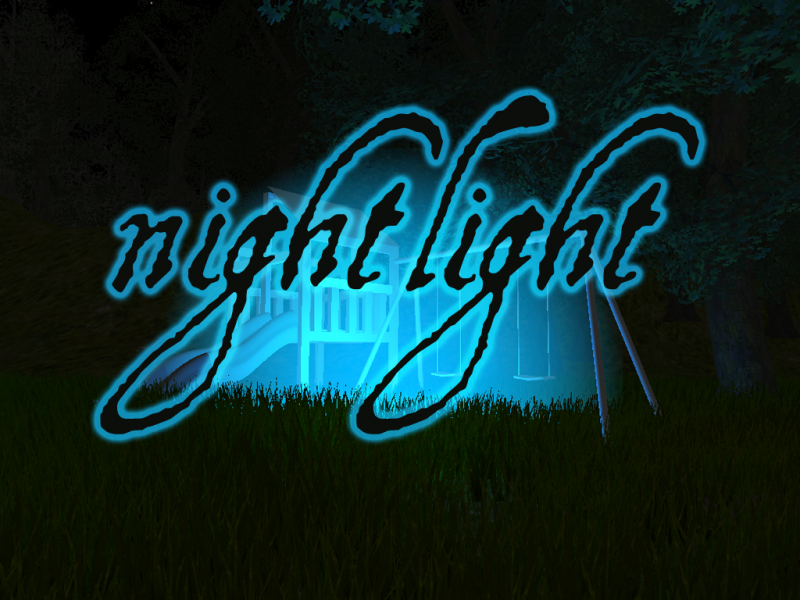 Lead Game Designer / Game Prototype Designer. 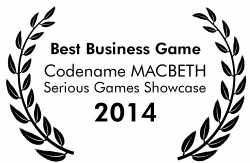 2014	Best Business Game – Intelligence Crisis: Codename MACBETH Serious Games Showcase. 2014 Best Adaptive Force Game – Intelligence Crisis: Codename MACBETH Serious Games Showcase. Fair Play was created as a way to address issues of implicit bias in a safe environment. 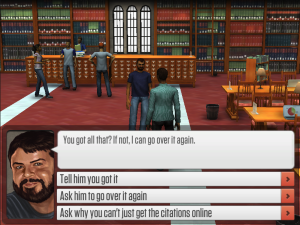 In Fair Play, the player assumes the role of Jamal, a new graduate student. 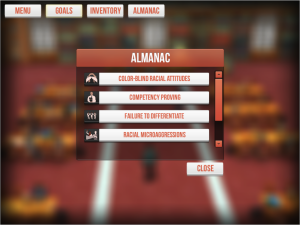 Along the way, the player is face with bias scenarios, which they must address in order to successfully make it through their first year. 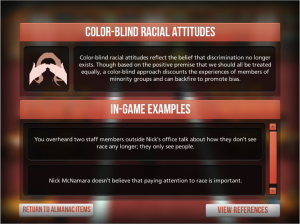 It was our hope that, through gameplay, players will be exposed to various anti-bias strategies, which they will incorporate into their daily lives. Lead Game Designer, Programmer, Writer, Producer. 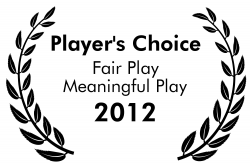 2012	People’s Choice Award, Fair Play, awarded at Meaningful Play 2012 Conference Game Exhibition, East Lansing, MI, October 18-20. Team members: Sarah Chu, Belinda Gutierrez, John karczewski, Adam Wiens, Erin Robinson, Jake Ruesch, Allison Salmon, Greg Vaughan. While visiting Denmark, I had the pleasure of visiting the CODER lab at the University of Arhus. My Time with the project was brief, mostly talking about score boards and time trials, but we had some great discussions. I totally recommend checking out their vimeo page. In Quantum moves, players try to move a probability distribution representing an atom to a goal location as quickly as possible. Players are judged based on speed and accuracy. The data collected from participants is mined by an algorithm, and the optimal path is used in the creation of actual quantum computers. Very cool! I attempted to address positive ways to deal with depression and fear through gameplay. Mainly, focus on the good things and collect them (blue lights) and rely on the things that you love/make you feel safe to protect you from negative emotions. This game uses AR technologies. You must also download Reactivision found at http://reactivision.sourceforge.net/ (also included in the build) Place the glyph (included) on something that you love or makes you feel safe. You may hold it up to the camera at any time to protect you from enemies. Alpha Racers is a fun and exciting new learning game that will help your child learn their letters and sounds! Unlike many alphabet games currently available, Alpha Racers is actually a real racing game, where your child learns their letters as they race for the trophy! An aspect of the original logo that always stuck around with me was the presence of a physical turtle that would obey the commands it was given. I always felt that this made programing in logo that much more impacting because something in the physical world responded to the commands issued in the program. In Tangible Turtle I decided to make the commands tangible instead. I chose to do this for many reasons centered around the idea that tangible objects would be easier to relate to than a computer program. This is especially true for younger children and those who are not comfortable using a computer. With tangible commands users would not have to worry about syntax or spelling, two things that often discourage people who are starting to program. 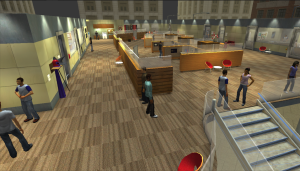 Pulse is an augmented reality video game for the ipod/ipod touch created in the winter quarter of 2008. In pulse a player’s movements in the real world are transferred to pulse’s virtual battlefield. In this way, a simple game of capture the flag is enhanced to include components of videogames such as weapons and health.